I want a picture to move to the bottom. If I press a button the pic should move down by 1. At least I said in function "fahren" to move the picture down by 1. So my problem is: I get several errors with these corX and corY thing. Without them it works perfectly but than its like a single-use button. The errors are: ViewController.Type does not have a member named corX and ViewController.Type does not have a member names panzer Where I get the errors I made // to show in which lines. //  Created by Shivank Agarwal on 19/05/18. //  Copyright © 2018 Shivank Agarwal. All rights reserved. Both lazy and computed properties help you deal with when the initial value for a property is not known until after the object is initialized. But there are some differences. I've highlighted the differences with bold. If you simply need to initialize a variable after some other variable(s) is initialized then you should use lazy ie if the point is to simply add a delay (so all required properties get initialized before) then using lazy is the right way to go for it. if the stored properties are set (or are reset again) then it will trigger a change in then computed property. A good example for using a lazy property would be that once you have firstName & lastName then you would lazily instantiate a fullName and likely you would never change the firstName lastName of your object your fullName is a onetime only... Or perhaps something that can only be done by lazy properties is that up until you don't access the property it won't ever get initialized, therefore this would decrease the initialization load of your class. Loading a heavy calculation. Additionally using the lazy will signal to other developers: "Hey first go read about the other properties and understand what they are...then come to this lazy property...since the value of this is based on them + this is likely a heavy computation that shouldn't be accessed too early..."
As for computed property a good example would be if you set the temperature to Fahrenheit then you also want your celsius temperature to change its value...and if you set the celsius temperature then again you want to change your Fahrenheit value. The problem is that a Swift default initializer cannot refer to the value of another property, because at the time of initialization, the property doesn't exist yet (because the instance itself doesn't exist yet). Basically, in panzer's default initializer you are implicitly referring to self.corX and self.corY - but there is no self because self is exactly what we are in the middle of creating. That's legal because panzer doesn't get initialized until later, when it is first referred to by your actual code. By that time, self and its properties exist. Have you tried to compile that? First, it is lazy without @ in the current Xcode version, and even then I still get the same error message. @MartinR Good call. All fixed now! @MikeS It sounds like you typed it rather than copying and pasting. You mustn't leave anything out. 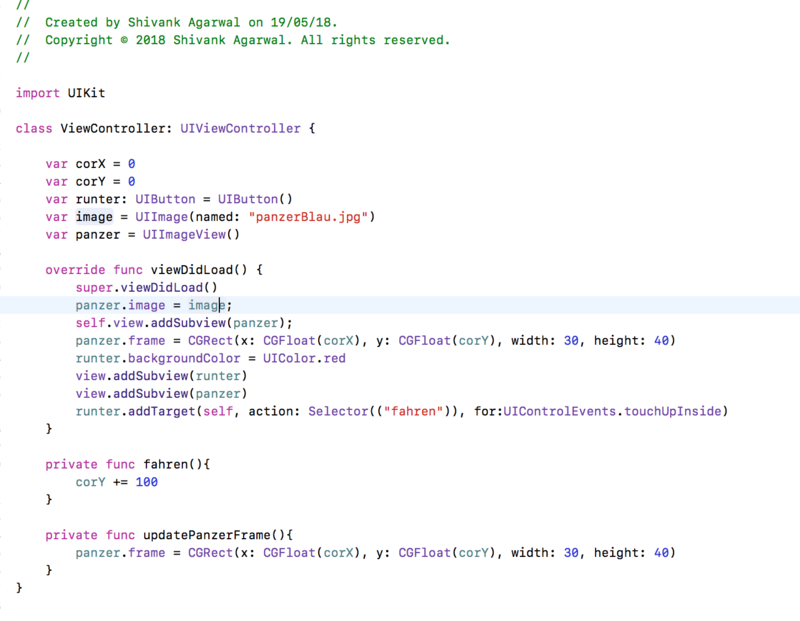 For example if you omit the UIImageView type declaration you'll get that error. Or if you omit the lazy declaration you'll get that error. It is all necessary. Copy and paste right out of your browser into your code. It compiles just fine in the current version of Xcode (Xcode 6 GM). This solution doesn't work. I have similar error trying to init label height constant using font constant. If I change height declaration to lazy var I will still be getting the same "Can't use instance member" error. Downvoted to prevent misleading. @kelin You can downvote if you like, but I assure you my answer works for the question that it answers. If you have a different problem, wouldn't it be better to ask a question about that than to assume I'm wrong when I'm not? @matt, your instructions don't work, just accept it. Only pkamb tells about 3 conditions that should be met to remove the compiler error: lazy, .self and : Type. Although you used : Type you didn't tell that this is important. And you answer is much longer and harder to read. I think it isn't fair that it has more upvotes. [SOLVED] UIImage appears to take up space beyond the bounds of its UIImageView? [SOLVED] Why don't use var at the beginning?